In the technology world, you’re only as good as the last product you released; and fortunately for AMD, their current product offerings are pretty darn competitive. AMD have disclosed the results of their Q4 2017 financial results, and there’s definitely a sense that the company is on an upward trajectory. Speaking in broad terms, AMD have predicted itself to enjoy a rather impressive 30 percent quarter-over-quarter in Q1-2018, spurred by high demands for graphics and other chips from the tech giant. Indeed, the companies CFO, Devinder Kumar had this to say “….2017 was a pivotal year for AMD. We grew annual revenue 25% over 2016 with revenue growth increasing every quarter on a year-over-year basis, culminating in growth of 34% in the fourth quarter of 2017. In addition, we expanded gross margin by 3 percentage points and achieved GAAP profitability for the year. Currently AMD are offering a plethora of different products, and as I’ve said in numerous articles and videos in the past (and my comments are certainly not unique); AMD are one of those companies in tech which has an incredibly diverse portfolio of products to leverage. Sure, Intel might be working on designing its own high performance discrete graphics chip, and Nvidia have the GPU market down to a science, but as of right now, AMD are where its at for producing solutions with APUs with X86 and GPU in mind. There’s a reason Intel used their IP for their new processors after-all, and I give Intel credit for a smart business decision. Indeed, with Sony and Microsoft steadily feeding AMD’s income stream (albeit, possibly not as lucrative of a contract as perhaps they had hoped) and with the X86 based APUs in each system met with positive reception from games developers, it’d not be a surprising decision if the next generation PlayStation and Xbox were to use a similar chip. In theory (and outside the topic of this article), AMD have considerably more roadmap offerings for both Microsoft and Sony’s next console. While Vega was met with a somewhat mixed reception upon launch, AMD’s processors were widely applauded. Yes, some games fell short of the performance one would hope (through a combination of poor optimization and lower clock speed, the former of these fixed with patches, such as Rise of the Tomb Raider and Ashes of the Singularity), but in the price versus performance war, AMD were winning in two fronts. The higher cores of Ryzen compared to the similar priced SKUs of Kaby Lake meant gamer’s whom also dabbled in content creation were met with an easy choice, and for those firmly in the HEDT market, well – ThreadRipper’s pricing was hard to argue with. Intel’s Coffee Lake (particularly the I7-8700K and the I5-8600K) are fantastic chips in their own right, particularly given the higher single thread performance compared to the Ryzen lineup. But of course, we’re waiting for AMD to counter – and that counter will be in two forms, the first is a 12nm Zen+, which as the name implies tweaks the current Zen architecture and shrinks it down from the 14nm lpp process to the 12nm process. After that, we’re looking at the release of Zen2, the ‘true’ successor to the current Zen architecture. This isn’t to say that Ryzen 12nm isn’t exciting though, with higher clock speeds (estimates are between 5 – 15 percent, although 10 percent is a safe assumption), and slightly tweaked chip design (such as reduced catch latency), AMD should have enough to hold off Coffee Lake. AMD have certainly good PR on their side, with many vocal of Intel’s handling of the Spectre and Meltdown issues, plus the continued push for new platforms from the company. While the 12nm Ryzen (known somewhat confusingly, as Ryzen 2000, thus making Zen 2 in theory Ryzen 3000) will stick to AM4. Sure, the 400 series platform will bring a few benefits (not least of all, increased PCIE bandwidth), but for owner’s who’ve already invested in say a Ryzen 5 1600 setup with a decent motherboard, AMD will likely sell a great number of Ryzen 7 series chips to just swap out and keep the motherboard and windows install alone. “In the server market, we will continue to work closely with major cloud vendors and OEMs to ramp their first generation EPYC-based systems while also completing key development milestones on our next generation Zen 2 based server platforms. Our Zen 2 design is now complete and we will be sampling to our customers later this year,” Su boasted. So, this is also a confirmation that the next generation Zen 2 design is complete, so there’ll be likely a series of performance leaks starting to emerge within the next several months; you know where to find those rumors and discussions folks (hint, here or the YouTube channel). Being realistic, while the 12nm Ryzen products will be on store shelves by about April of this year (2018), the Zen 2 architecture probably won’t emerge until next year where it’ll face off against Intel’s Ice Lake and friends. This year; and for gamer’s seeking an upgrade, it’ll probably boil down to the Coffee Lake-S refresh or Ryzen 2000 – and for whether you’re an Intel or AMD fan (or just wanting the best bang for your buck, which is the camp I champion) end users are the real winners here. AMD’s Radeon Vega series of cards is doubtlessly one of the strangest launches in graphics card history. A series of features which weren’t ready in drivers at the time of launch (such as HBCC being fully implemented, or Primitive Shaders), limited availability and game performance which didn’t quite manage to hit the performance targets we gamer’s had hoped. But the architecture obviously has a lot of potential left in the tank, and with a few tweaks and a shrunk process we could certainly see a very powerful GPU. Adding that AMD are considering GPU bifurcation (that is, further separation of architectures for different usage scenarios “You will see us move on this, and we’re very committed to gaming so that’s not going to change, but you will see us do some more purpose-built products for the compute side of things.” Many tribute Vega’s issues to be that AMD’s resources (both financially and time) were limited during development, and thus try tried to have essentially the same hardware accomplish too many things. Tweaking the silicone further for compute, while having more gaming and home focused SKU’s might help these issues. So, for the short term it appears AMD are doubling down their commitment to release the 7nm Vega, although there’s precious few details to go on. Speculation would argue that since its built on a 7nm process, we should see higher clock speeds and possibly more stable boost clocks. Heat and power consumption were an enemy of the 14nm Vega (particularly the 64) GPUs. A shrunk down process could certainly help eliminate those issues. Another potential tweak is increasing the number of shaders present on the silicon. The current top billing for Vega is Vega 64, Vega New Frontier Edition or the Radeon Instinct MI25. Each of these GPUs contain 4096 shaders (64 shaders per single NCU, giving the math 64×64 = 4096). An increase of shaders and higher clock speed would certainly help in performance, but there’s one flaw in Vega that this might actual help highlight; that is memory bandwidth constraints. Our own tests overclocking the HBM2 in a Vega 56 quickly showed performance gains (and proving Vega wasn’t so much a star, but a hungry memory bandwidth starved black hole). With the current Vega New Frontier Edition and Radeon Instinct MI25 both limited to ‘just’ 484GB/s bandwidth, more or faster running shaders could probably benefit from a bandwidth boost too. Fortunately for AMD, faster HBM2 memory is certainly available for purchase, with SK Hynix and Samsung now starting production of 2.4gbps per pin HBM2; so in theory at least, AMD could largely negate these issues, with just two stacks of HBM2 able to put out way north of 600GB/s bandwidth (and four stacks of HBM2, with 4096-bit bus and running at the 2.4.gbps will offer over 1.2TB/s bandwidth). 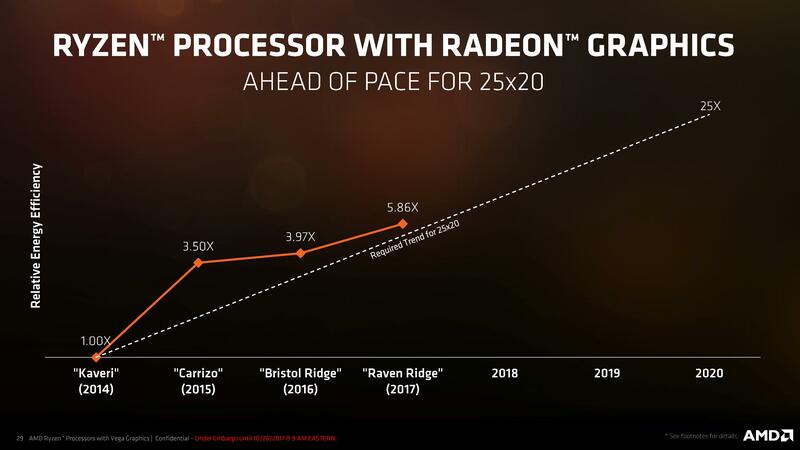 For gamer’s though, what AMD are planning for the Radeon lineup is a bit of a mystery; particularly if Nvidia decide to release a follow up to the Pascal within the next few months. There are rumors and talk that AMD could leverage the Vega IP for lower end discrete GPU SKUs (in effect, replacing the current Polaris found in the RX 400 and 500 series GPUs). But what that would look like is anyone’s guess, and certainly may not be enough to counter a GeForce 2xxx series. We could assume presume if this is a ‘thing’ AMD would also design the chips with a GDDR5 or GDDR6 memory controller. To AMD’s credit – the datacenter (for which the 7nm Vega is designed) is very lucrative. Machine learning and HPC market growth has been startling; and in 2016 alone was worth over 11 billion USD in just servers; and securing a piece of that market will be critical for AMD’s long term success, even in the gaming segment. The more cash they have to put into research and designs, the better products end users of all markets are able to obtain. As usual, it’ll be a curious next several months to see what’s released; but one thing is for sure, we’ll bring you the coverage to let you know what’s going on! Tagged with amd navi, navi, ryzen, vega, vega 7nm, vega machine learning, zen 12nm.